Aeropostale, Dakar to Paris, Gontier & Lagahuzere red/grey envelope franked 3F, company seal verso. Air France/ Aero Postuguesa, Senegal to Portugal, cover from the Portugese Consulate in Dakar postmarked February 18, 1936 flown to Lisbon with arrival b/s February 22nd. The cover travelled by Air France from Dakar to Tangier (Morocco) and from Tangier to Lisbon by Aero Portuguesa, a subsidiary of Air France founded in June 1934. Scott 105 and 120 (pair). Attractive New Year card flown from Dakar, date illegible, to Paris, b/s December 23, 1937, Air France Dakar handstamp. The postcard is an artist’s rendition of the Dewoitine D338 aboard which this card was probably flown. Scott 81, 142 and 156. Few edge crumples on non picture side, otherwise fine. 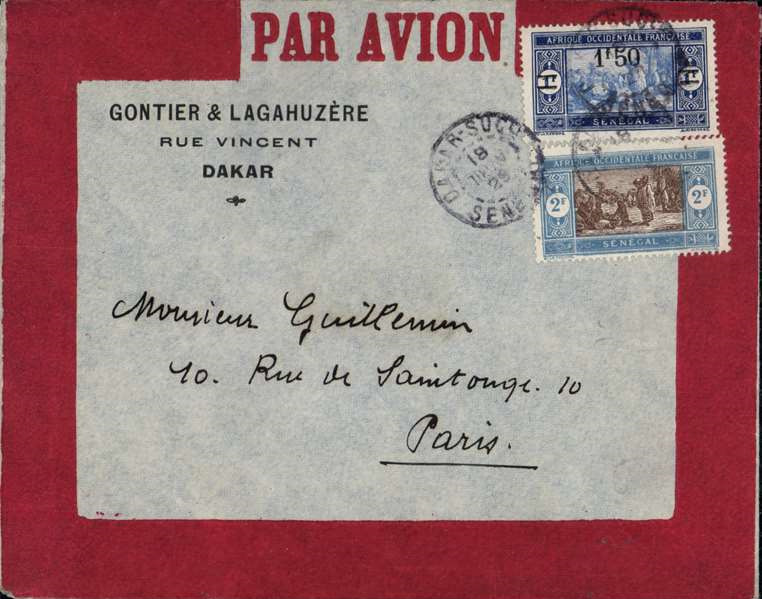 Cover postmarked Dakar March 28, 1938 to Paris (no b/s). 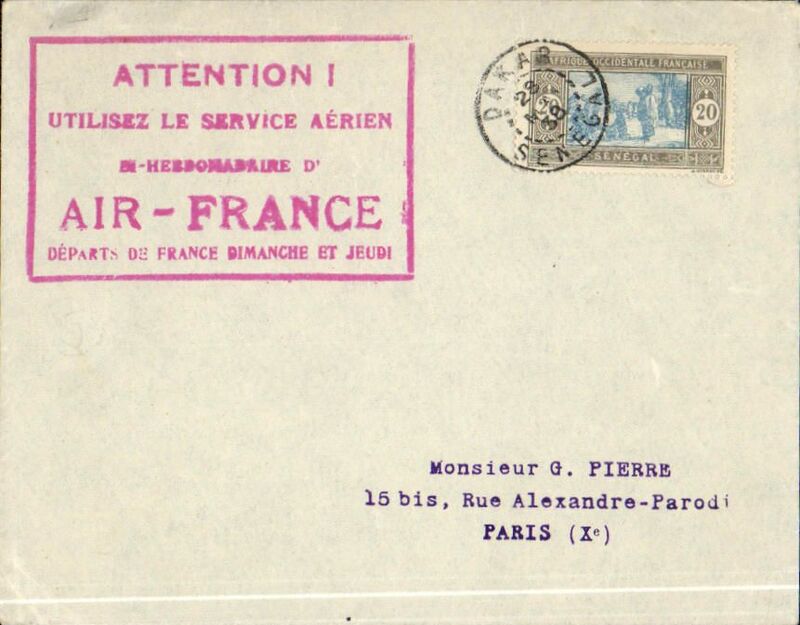 Large handstamp advertising bi-weekly airmail service by Air France between Senיgal and France. This cover franked with only 20 centimes probably travelled by ship and not air. Scott90. Scarce F/F military airline R.O.T.A.M. 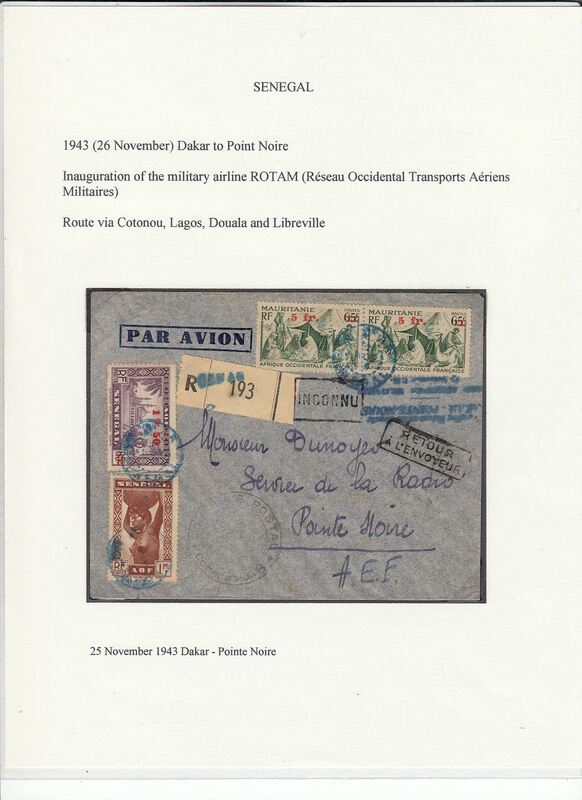 (Resau Occidental Transports Aeriens Militaires), censored registered (label) airmail cover, Dakar to Pointe Noire, Middle Congo, bs 28/11/1943, dual franking 2F50 Senegal and 5F x2 Mauritania opts, canc blue ?21 Nov Senegal cds (20% legible), blue four line inauguration flight cachet (25% legible), black circular Senegal Commission B (Dakar) censor mark. Flown via Cotonau, Lagos, Douala and Libreville. Scarce F/F military airline R.O.T.A.M. 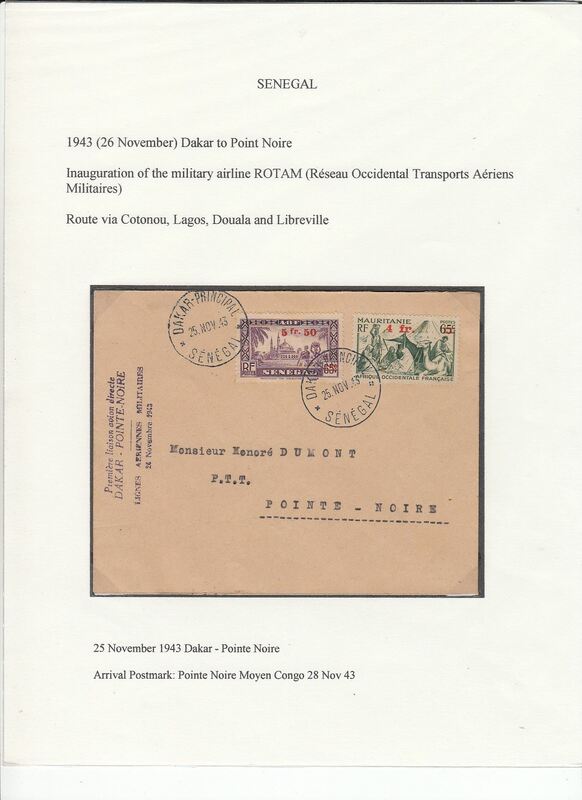 (Resau Occidental Transports Aeriens Militaires), Dakar to Pointe Noire, Middle Congo, bs 28/11/1943, exibiton quality cover with dual franking 5F50 Senegal and 4FMauritania opts, canc Senegal cds, fine strike violet four line inauguration flight cachet. Flown via Cotonau, Lagos, Douala and Libreville. An exhibition quality cover written up on display page with nice route and airline carrier documentation.